Food donations are only accepted on Mondays and Wednesdays from 9:00 - 2:30pm and on Fridays from 9:00am - 12:00pm. The Food Pantry is located at 27 Haygood Ave, Atlanta, GA 30315. For ease of delivery, you may drive your vehicle up the driveway between the Lokey Center and Emmaus House and park in front of our two-bay garage doors. Contact Adam at 404-525-5948 ext. 25 or at adamseeley@emmaushouse.org for more information or questions. WHEN WE FIRST MET MICAH* at our Children’s Defense Fund Freedom Schools® program in the summer of 2015, he was a rising fourth grader at D.H. Stanton Elementary School. Micah was hard to miss. He had a way of lighting up a room with just his smile. His intellectual curiosity inspired the tutors who worked with him. But at home, Micah experienced some serious challenges. His mother, La ‘Tasha, was suffering from significant health challenges that threatened them with homelessness. One weeknight in July, Micah’s mom attended one of our weekly meetings for parents of Freedom Schools scholars. There, La ‘Tasha learned about the other services available at Emmaus House. And when our team realized the crisis La ‘Tasha and Micah faced, we invited them to become one of the first families to enroll in our Peoplestown Family Initiative (PFI). PFI is a new case management program that seeks to help families to overcome the barriers that often lead to poverty. La ‘Tasha embodies all that we admire about the strength of a mother’s love. That love compels her to never give up as she works to care for Micah. Still, she found herself struggling to help her son with the newer approaches to reading and math, now taught at D.H. Stanton, and schools across the state. And she was not the only parent to struggle in this way. More and more parents in Peoplestown communicated similar challenges. Emmaus House responded by launching Parent Power (formerly called Homework Relief Bootcamp) Through a partnership with Literacy Action, we began teaching parents how to help their children with their reading. We also taught them tools and strategies so they could help with other subjects as well. By implementing La ‘Tasha’s new skills, Micah caught up in grade-level reading, regaining 19 months of instructional level in just 16 weeks! *The real names of our clients have been changed to respect their privacy. As our relationship with La ‘Tasha grew, we learned that she and Micah were about to lose their home. The owner of the apartment building they lived in had stopped taking Section 8 subsidies. That’s when our team sprang into action. We found another property in the final phases of construction that would keep La ‘Tasha and Micah in safe, affordable housing. However, in an all-too-common turn of events, the developer halted construction just days before La ‘Tasha and Micah were to move in. Upon learning the news, Adam, our director of social services, went directly to the developer's office where he refused to leave until they resolved the situation. And under threat of arrest, Adam’s advocacy went all the way to the owner of the company in Nashville. Within days, the developer completed the unit, and La ‘Tasha and Micah had a beautiful new home. If Micah had simply attended the CDF Freedom Schools program for six weeks one summer and gone home, he and his mother could have ended up homeless. But because of our deep commitment to embracing the whole family, we met La ‘Tasha. A two-generation approach allowed us to harness the power of community, education, hope and love so that La ‘Tasha and Micah can work toward a better life for themselves. Now, this remarkable family is stronger and more stable than ever. The primary goal of the Peoplestown Family Initiative is to help clients increase their income levels, to teach financial management skills, to address health related issues and promote healthy living, and to secure or improve proper housing. Clients work with a case manager to create a customized service plan. Our CDF Freedom Schools program aims to shape children’s futures by developing strong, literate, and empowered children through six weeks of summer reading enrichment for children who might otherwise not have access to books or the environmental structure necessary to do summer reading. Parent Power is an eight-week program designed to increase the literacy skills of parents and their children. Working in partnership with Literacy Action, we teach parents specific skills an strategies for helping their children with homework and reading. In partnership with Community Guilds, Inc., our redesigned Saturday program features the award-winning STE(A)M truck and uses project-based learning to incorporate science, technology, engineering, and math (STEM) along with our existing arts program. Youth on the Move strives to provide middle and high school students with opportunities that will prepare them for success as adults through enrichment, education, empowering experiences, and peer support. For 50 years, Emmaus House has stood with the residents of Peoplestown in their quest to build better lives for themselves and their children. From our early days during the Civil Rights Movement to the uncertainty of today, we have loved and learned, prayed and mobilized, and laughed and cried with the incredibly resilient people of this historic neighborhood. As we look forward to the next 50 years, we are clearer than ever about the work before us. At Emmaus House, we stand for justice and equity. Justice and equity rooted in faith and a deep respect for the dignity of every human being. At Emmaus House, we harness the power of community, education, hope and love to dismantle poverty, racism, and other barriers to opportunity in the lives and communities we serve. In neighborhoods like Peoplestown, we see too many displaced families, shuttered local businesses, and kids kept indoors for fear of violence. We watch our neighbors confront challenges like limited access to affordable housing and underfunded schools. We see the barriers that limit the opportunities that many of us take for granted. And we recognize that our work is as necessary and important now as it was when Fr. Ford moved to Peoplestown in 1967. In response to these threats, Emmaus House offers academic and social enrichment programs during the week, on Saturdays, and during the summer for children and youth. But, we know that supporting children is only half of the solution. We can best serve families through a two-generation approach. One that addresses the needs of the entire family — children and parents together — so that they can experience academic achievement and sustained economic success. I hope you’ll read the story of La ‘Tasha, and her son Micah, below — an example of our two-generation approach in action. Through your generous support, we can help remove those barriers to opportunity that so many families on the south side of Atlanta face. Thank you for continuing to walk this journey with us at Emmaus House and in Peoplestown. Emmaus House responded by launching Parent Power! (formerly called Homework Relief Bootcamp) Through a partnership with Literacy Action, we began teaching parents how to help their children with their reading. We also taught them tools and strategies so they could help with other subjects as well. That’s when our team sprang into action. We found another property in the final phases of construction that would keep La ‘Tasha and Micah in safe, affordable housing. Upon learning the news, Adam, our director of social services, went directly to the developer's office where he refused to leave until they resolved the situation. And under threat of arrest, Adam’s advocacy went all the way to the owner of the company in Nashville. Parent Power! is an eight-week program designed to increase the literacy skills of parents and their children. Working in partnership with Literacy Action, we teach parents specific skills an strategies for helping their children with homework and reading. The Road Episcopal Service Corps is a paid urban fellowship year for young adults (21-32) who want to put their faith into action, make the connection between faith and social change, and work alongside others in community. Road Fellows serve 32 hours a week with agencies and people committed to social justice, advocacy, and compassionate care for vulnerable people. Fellows live together in an intentional spiritual community at Emmaus House. The Road Fellows also engage a curriculum of social justice education, spiritual and theological reflection, vocational discernment, and leadership development. The Road equips fellows with practical skills and hands-on experience for lives of active hope and leadership. The Road seeks Fellows who bring passion, energy, and imagination to the collaborative endeavor of building more just and liberating communities and are ready for challenging, creative, and impactful work. The Road welcomes fellows from all walks of life and many faith perspectives, believing the gift of differences enriches a year of inner and outer growth. The fellowship year begins August 24, 2016 and ends in mid-July 2017. The Road provides a stipend to cover costs of food, transportation, and personal expenses; housing and utilities; and health insurance. Mother’s Day is this weekend, and what better way to celebrate than helping other mothers and families in need? Take a look at some of our programs that serve mothers, families and children in need and learn how you can help this Mother’s Day. 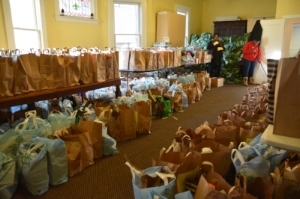 Emmaus House uses donations to provide struggling families in poverty with essentials, such as a Georgia ID, groceries from the food pantry, furniture bank vouchers, health care assistance, help with rent and utilities, as well as parenting education classes and a "Parent Cafe." Emmaus House offers the "A Great Start" program to struggling parents with children ranging in age from the prenatal stage to five years old. The program is to teach good parenting techniques from the beginning of the child's life to form a strong family foundation for the future. Not only do parents receive instruction, but dinner, childcare and other supports that will help the family unit. The Parent Cafe' is designed to bring parents from all backgrounds together to discuss, support and share parenting tips and ideas, as well as helpful information and resources when it comes to parenting. This cafe is a judgement-free zone, and is intended to help encourage parents to build a social network and a sense of community with other parents in their same neighborhood. To learn more about about programs for children, parents and families at Emmaus House, click here. To make a donation to Emmaus House on behalf of Moms, click here. 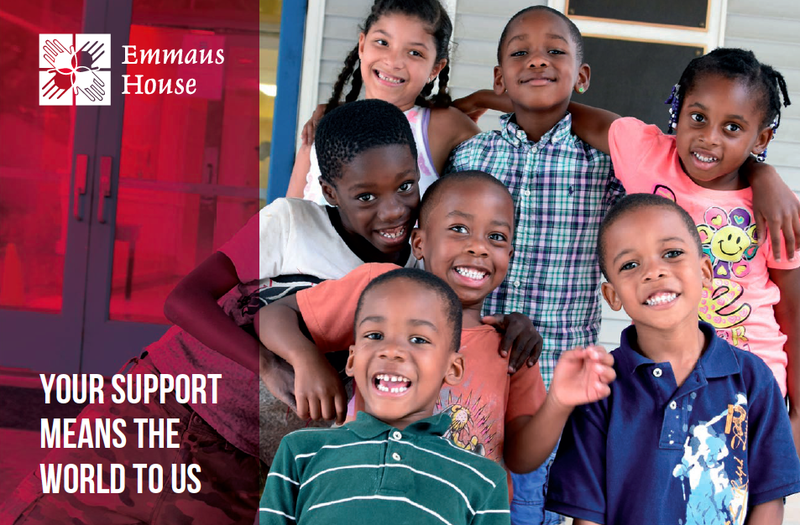 As Emmaus House begins a new chapter, we are committed to seeing families in Peoplestown move beyond poverty through strategies that support educational achievement and economic independence. To this end, we are making some enhancements to two of our flagship programs, Camp Summer Hope and the Lokey Center. Here, we look at the Lokey Center. Look for more on Camp Summer Hope in our next email. For many years, the Lokey Center at Emmaus House (formerly the Poverty Rights Office) has served as our drop-in help center, offering emergency assistance to our neighbors in Peoplestown. This work is important and it will continue. However, with 48% of families in Peoplestown living below the poverty line, we know that we need to do more to help people to break the cycle of poverty. Therefore, as an evolution of our work, we are pleased to announce our 25/15 Case Management Initiative, a program that will enable us to serve families in a deeper, more transformative way. In 2015, we plan to enroll 25 individuals and families in a holistic program that will lead to greater overall wellbeing and, ultimately, increased economic self-sufficiency. Utilizing an evidence-based model called the Self Sufficiency Matrix, we will track the progress of participants in categories like housing, employment, income, food, childcare, children’s education, adult education, healthcare coverage, life skills, and family/social relations. To maximize effectiveness, we will institute a two-generation approach, coordinating services for parents and their children – a key to breaking the cycle of poverty. To this end, we anticipate that 75% of the adults enrolled in the program will have children who participate in other Emmaus House programs, such as Camp Summer Hope or Saturday Arts. In order to move all of our programs to the next level, we have created a new staffing model at Emmaus House, resulting in some shifts in responsibilities. Ann Fowler, formerly Director of the Lokey Center, is now serving as Director of Education Services, a new role that will utilize her education background to bring about significant innovation to our summer program. New to Emmaus House is Adam Seeley, our new Director of Social Services. Adam comes to us with a wealth of relevant experiences, most recently as Chief Operating Officer of the Gateway Center. Additionally, Helen Bohanna, a longtime volunteer, has joined the staff as a part-time caseworker. We are very excited to have such highly qualified individuals working to fulfill our mission here at Emmaus House. Emmaus House will continue to offer emergency drop-in services. We will continue to be a calm port in the storm for our neighbors in crisis. Our 25/15 initiative will build on our already successful program, making our work even more transformative for our neighbors and friends here in Peoplestown.